Outbrain, a content discovery and recommendation platform, is launching a new audience development network called Sphere. Sphere will allow publishers to recommend content from other publishers and make revenue from it. The goal behind Sphere is to help what Outbrain calls “premium” digital publishers take back audience from Facebook, add a new revenue source and financially incentivize longer page visits — sometimes measured as "engagement" — by users. Relying on one platform for marketing, revenue and distribution can be “toxic” for publishers, Crenshaw said. The motives of publishers and Facebook “are not aligned. Facebook is not in the business to create the best news experience online." A group of publishers invited to the platform will display the Sphere widget on their sites. 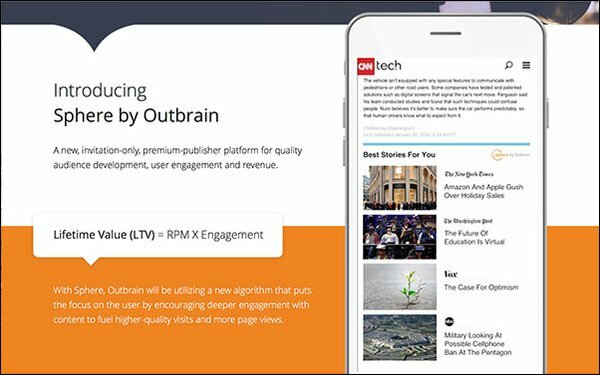 Outbrain's algorithm chooses links to display on the widget, recommending content from other publishers in the closed network. CNN, Meredith and Penske Media are a few of the publishers that have signed up as founding partners on the new platform. Outbrain is known for the "Other stories from around the Web" recommendations at the bottom of articles. The company’s content discovery platform surfaces sponsored content to users from across the web, including relevant videos and stories tailored to the reader. But in Sphere, those articles come from publishers in the Sphere network. So how do publishers make money from the platform? If a reader is on CNN.com, for example, the Sphere recommendation box may display a link to an article on Vox. When a user clicks on that link and gets taken to Vox, CNN gets “a penny and a half,” Crenshaw said — the publisher keeps 100% of that revenue. But once a user clicks again on Vox’s site, that signals audience engagement, Crenshaw said, and a longer visit from a user than just reading that first linked article. A penny and a half goes to Outbrain, from Vox. In this way, publishers in the Sphere network “can work together and broker a free traffic exchange on the first click, and get Outbrain to drive beyond the first click to the publisher's site,” Crenshaw said. This may seem counterintuitive — why would a publisher link to another publisher’s content on their own site? In the past, publishers viewed each other as the “primary competition for attention.” Now, the competitors are Facebook and Google. Using Sphere, publishers can recirculate their audiences on their sites, he said. “Publishers are much more powerful and become more successful working together than against one another,” Crenshaw said. For now, the network is managed by Outbrain founder and CEO Yaron Galai. Publishers using Sphere get a say in who participates in the network, so they won’t be surprised to see a new publisher recommended on their site. And unlike Outbrain’s regular recommendation widget, Sphere displays publishers’ logos “loud and proud,” making it easy for users to recognize which news outlet they are heading to when clicking on a suggested article. This is one of the issues Outbrain sees with Facebook.